Webix provides the possibility of integration with Vue JS framework. We advise you against using Vue.js as an MVC framework for developing a Webix-based applications, since there are obvious pitfalls. Webix widgets won't adjust size to Vue layouts and such approach adds too much overhead for not so many benefits. Instead, we highly recommend you to use the Webix Jet framework for building web apps with Webix, as it is native for the library and will help you to manage the development stages in the most natural way. If it's not enough, you can create a custom component by wrapping a Webix widget into a Vue component. Pay attention that the discussed integration isn't included into Webix library. To start using it in your project, you need to take the necessary sources from GitHub. Besides, they are available from CDN. If you are going to implement a large-scale application with Vue.js, it may require hard work with various data. In this case powerful Webix data widgets will help you to deal with data. To begin with, don't forget to include the necessary source file. It's possible to bind data of a Webix widget and a Vue template. For this, you just need to use common Vue technique: the v-bind directive. The < webix-ui > element gets the datatable configuration and is loaded with the related data. The Clean button inside the template is subscribed to the event click via the v-on directive. When the button is clicked, this event fires and cleans data in the datatable. You can also implement two-way data binding. It means that if you change something in a Vue component, the corresponding changes will be invoked in the bound Webix widget and vice versa. The regular v-model Vue directive can be used for this task. We've bound the "result" data attribute both to the input and the slider elements. When the v-model bound value is modified, the onValue event fires in the Webix view. 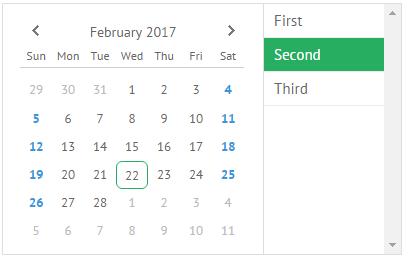 When the value of the Slider view is changed, its native event onChange fires and informs Vue about value change. The declaration this.$scope inside of the onChange event handler points to the < webix-ui > element, i.e. on a Webix view as a Vue component. You can make use of a Vue reactive template inside of a Webix-based application. There is a view:"vue" widget added specially for this purpose. It presents a Vue template that can be used as a native Webix widget. The only thing you need to do in order to use it in your app is to include the corresponding JS file. Let's consider the following example. 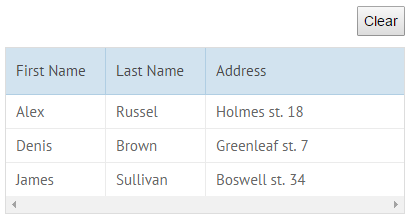 We have a Webix Layout with a List view and want to display an item data in a template depending on the selected List item. You can create a custom component by wrapping a Webix widget in a Vue component and use it as a native Vue template. This case is rather useful when the same UI is reused throughout an application and will help you to keep all the used data together. For example, we have an input and a slider. We want them to update their values simultaneously. Before starting to work, don't forget to include the necessary source file. You can find the details on registration of new components in the Vue.js documentation. The full list of options is given in the Vue.js API. The mounted() function will create a new instance of a Webix Slider. The destroyed() function will destroy the Webix Slider instance when it will be no longer needed. We put a Webix-based slider created above into the Vue template. Also we bound the "progress" data attribute both to the slider and the input elements. Thus, when its value changes, both controls will update their values correspondingly. In case you are still interested in creating your own custom Vue component with Webix widget inside, read the section Creating Custom Vue Component.